A mammogram is an X-ray of the breast. We use mammography as a screening tool to detect early breast cancer in women experiencing no symptoms. Mammographers are radiographers who are trained in imaging the breast. They are responsible for producing breast images of the highest quality to maximise cancer detection. Many radiographers are not currently working in their profession having left for a variety of reasons, including raising a family or trying a different career. Returning to practice is a very manageable option for many. Qualified radiographers who return can bring valuable skills and experiences to the breast screening service. Radiographers considering returning to work as mammographers need to meet the registration requirements of the Health and Care Professions Council (HCPC). Those who have been out of practice for more than 2 years will need to spend time in a clinical placement updating their skills and knowledge before they can re-register with the HCPC. There is a process and support available for this. PHE Screening is backing the current national return to practice campaign and is offering support and guidance to mammographers who need to renew their registration with the HCPC. Health Education England (HEE) is running a national programme to attract qualified radiographers and other allied healthcare professionals back into practice. The programme supports returners to meet HCPC registration requirements and get back into practice in the NHS. Employers can access information on how to support and achieve successful clinical placements. PHE Screening is supporting radiographic workforce recruitment in the breast screening by working as part of the HEE return to practice (RtP) programme with a focus on support for radiographers considering RtP in mammography. 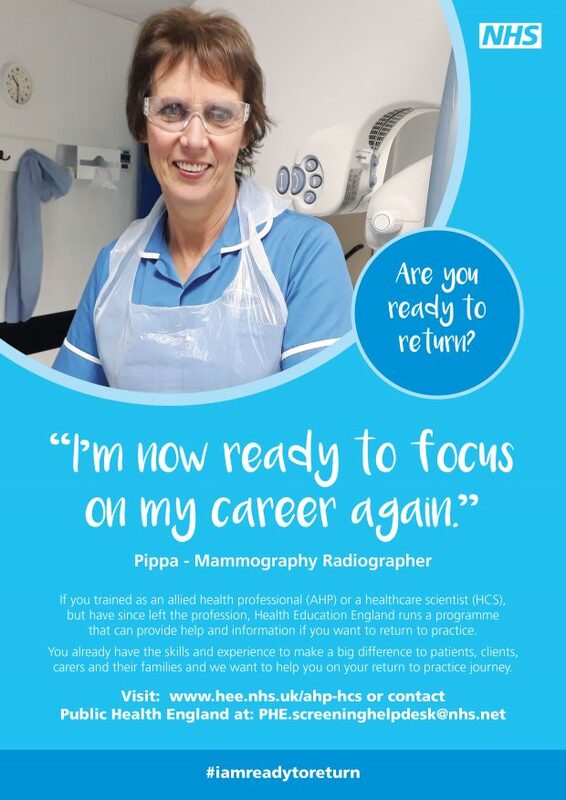 We have created a poster, business cards and a case study aimed specifically at anyone thinking of coming back to work as a mammographer in the breast screening service. You can download the case study, which is the story of Philippa Martin’s successful return to practice in breast screening. Breast screening centres are using the resources to run local campaigns to promote mammography return to practice. In addition, we have put together a toolkit with information for anyone thinking of returning to work in breast screening. You can get a copy by contacting the PHE screening helpdesk at PHE.screeninghelpdesk@nhs.net. Further information is available on the HEE website for both returners and organisations offering a clinical placement. There is also support, advice and information available from the Society of Radiographers...https://www.sor.org/career-progression/return-practice. The Society of Radiographers are working closely with Public Health England and Health Education England on this project.